1) Why is wearing clothes? He is supposed to be naked! 2) Why he is wearing a kippah? He wasn't Jewish! 3) Why does he have such a long beard? Isn't he supposed to be twenty years old? I presume that the artist's mind works as follows: Adam=Biblical figure who was not evil=venerable rabbi. But I'm not in such a strong position from which to criticize. People often ask me how to teach Maaseh Bereishis to children. My reply: I have a hard enough time teaching it to adults! I really don't know how to successfully teach it to children. My feeling is that one has to adopt a gradual approach, while always making it clear to them that their understanding will still undergo further refinement. Your daughter colors very well. Are we seeing the handiwork of a future Zoo Rabanit? You forgot to mention the aggada that monkeys originate from devolved people from the tower of Bavel and thus according to Chazal were probably not present in Eden. The pink shirt comment was classic! On a more serious note, I don't really see the problem in this case. The heading on the picture is what was created on the sixth day, not how was life in the Garden of Eden. The answer is "Man and Beast" and so the artist draws his versions of an ideal man, elephant, etc. I don't think there is an attempt here to portray the historical Adam Harishon as a Ben Ish Chai lookalike, although I seem to remember that in past years you posted a child's picture with Adam (and Chava?) in the Garden with full chasidish regalia where that tendency was more obvious. I agree with your approach to teaching Bereshit and don't really hope to see my kids come home from school with anatomically correct Adam and Eve pictures. 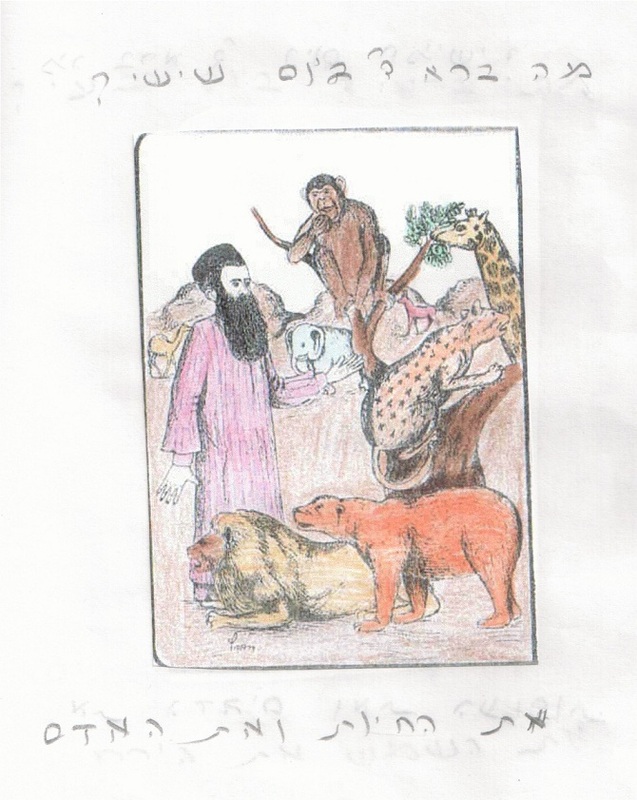 I'm afraid that the one teaching it does seem to accurately reflect is the statement in the talmud (cited by Rashi) that, while waiting for his true bashert, Adam was busy getting it on with every species of animal he could possibly get his hands on. I like those kind of pictures more when they put him in a shtreimel (seen those come home). Why are you complaining about the animals from Africa... shouldn't you be complaining about the bear?! Don't you know that man originated in Africa? It even says that the Nile went through the Gan Eden :) And the amazon! Are you sure this is supposed to depict Eden? The text says, "What did Hashem create on the sixth day? The (land) animals and the human being." The "6 days" text is one story, Eden is another. So Adam doesn't have to look young, without clothes, etc. The animals can be from anywhere. As for the kippa, of course he's Jewish - and no doubt a fantastic lamdan! BTW, I agree with Eric - great coloring job! BTW, whatever you want to say about these midrashim, many amoraim hold that they weren't naked (cf Torah Shleimah on 3:1). That said, there's no de'ah I'm aware of that holds it was pink. I once read John Derbyshire's book Prime Obsession, which deal with math. About the square root of a negative number, he said it doesn't exist, but he "reserved the right to change his mind about it later." When I teach this stuff to my kids, I teach them the traditional, literal account, but reserve the right to change my mind about it later. I've actually told them that knowing these stories and TAKING THEM SERIOUSLY will make them fit to pass on their genes. The statistics bear this out in that religious people are more fertile than the irreligious. "He wasn't Jewish." Yes and no. According to him, "atem kruyin adam" complements the above. "Why does he have such a long beard? Isn't he supposed to be twenty years old?" Now you're just plain jealous! jk but it's evidence that you haven't seen many Chabadsker 20 year olds. that is difficult, or virtually impossible to teach bereishis to adults and children speaks volumes. That monkey in the tree is eating something ... a bat egg perhaps? I've always felt that progressing the way we teach Torah to children is similar to how we teach math. When a child is 4 years old, we tell them that it's impossible to do 4 minus 8. It's not important for them to understand negative numbers yet because it's too complicated. As they get older you say, ok, really you can do this. You slowly refine the education. Torah is the same. When we teach to children, for example, that Avraham shattered his father's idols, it's a great story that gets the kid's attention and teaches some nice lessons. As they get older though, they need to start to understand that it's not part of the text of the Torah and we need to figure out what the Midrash is trying to convey. Perhaps part of the problem in a lot of schools is that the understanding of a Midrash like that one is perpetually understood on that Kindergarten level and never re-evaluated later in life. This isn't a Creation thing, as such. When my kids bring home pictures depicting the Avos or the Shvatim or the Bnei Yisroel in Mitzrayim, they're all made to look like Chassidim. Curly payos, long robes, the works. And for some reason the Egyptians always look like Cossaks. One of my kids once brought home a picture depicting Yitzchak and Rivka davening for a child. They're in a room with a sofa, a window and a framed picture on the wall. How does citing R' Tzadok help support the anachronism? His interpretation was also anachronistic. "Let's not even ask why animals from central Africa are there." "1) Why is wearing clothes? He is supposed to be naked! 3) Why does he have such a long beard? Isn't he supposed to be twenty years old?" - 1) would you rather your daughter drawing naked pictures? I think that would be a greater problem. 2) Non-Jews also wear head coverings in many places. 3)a 20 year old can also have a long beard if he doesn't shave. People often ask me how to teach Maaseh Bereishis to children. My reply: I have a hard enough time teaching it to adults! But you know how to learn it? Anyone want to draw a more literal artistic representation of this scene? It could totally be done in a modest fashion with an animal or bush obscuring Adam's nether regions. It's very interesting to see how much charedi culture is influencing literally everything down to coloring sheets (I am aware of the traditional family scenes coloring sheets depicted around a Shabbos table and the Avos, but not Adam). > 1) Why is wearing clothes? He is supposed to be naked! According to the Maharal he was metaphysically naked in the "real" universe. Before Avraham Avinu was chosen the mission to serve God devolved on all humanity so everyone had an obligation to wear a kippah (and shtreiml on Shabbos). That's the easiest one. He was created that way. God wouldn't want someone who didn't look frum running around his garden. I always wondered what the katnot 'or looked like! Q: Did Avraham Avinu and Moshe Rabeinu wear a kippah? A: The wore very large head coverings. Because Rmbam writes in hiilkhot deot 5:6 that head covering relates to modesty, and they were very modest. Funny stuff. In yeshiva the joke went: "how do you know that Yaakov Avinu wore a black hat? It Says "Vayeitzei Yaakov"; woulda tzaddik go out without a black hat on his head? If you disagree so send your daughter to a different school. Funny stuff. In yeshiva the joke went: "how do you know that Yaakov Avinu wore a black hat? It Says "Vayeitzei Yaakov"; would a tzaddik go out without a black hat on his head? Iyov's tzidduk haddin includes the phrase "`Arom yatzati mibbeten immi." So we might think it is possible for a tzaddik to go out without a hat, as Iyov was not wearing clothes at all. Ah, but in that pasuk "yatzati" is spelled chaser, indicating that yes, in this case, a tzaddik went out without a hat, but it was exceptional. Good grief and people ask my why I don't want to send my kids to school??! Indeed, I think there is a definite issue with how Jewish artists depict Adam. Unless they use the old figleaf trick, then they have to show him sans Brit. Now how would a nice frum artist know what that looks like? Re: how to teach this stuff to kids - I am not sure why Kodesh teachers feel compelled to give kids all the answers. A little uncertainty is ok, so long as they feel secure in the important things. why do so many people think it is difficult to teach Genesis to children? Anyone with a religious education learned Genesis, and if something stuck in the student's brain, there was some success. In fact, the colorful nature of the stories (both text and midrash) make it rather easy to teach. The real question is one of continuing education - why do we find it hard to RE-teach Genesis once one is more mature and (hopefully) more sophisticated. I find that most people who learn Chumash when they are young, feel that they already know it, and therefore do not feel a need to learn it when they are an adult. Consequently they are left with a false image of the Torah. This type of teaching and conditioning, leads to more of the same when learning Gamara etc. I had realized this when I was asked. "Can it be true, that all trees and all plant life actually grew on the third day, as stated in scripture" Bereishis,1:12??? I have found that even most of the Rabbis who teach in the Yeshivas, (sadly) answer, "Yes, is it not possible for God to do anything?" From these verses we learn that the Torah itself is teaching us that it is not always to be taken literally. Rav Kook זצ"ל told his talmidim to start teaching children Chumash only from Parashat Lech Lecha because Maaseh Bereishit was far too complex for young children to properly deal with. i told this to a friend some years ago and he told the following very interesting story. [i personally can't vouch for the accuracy.] R Wolbe implemented in his school [run by his students] that the children start chumash with לך לך. At some point the gadol hador was told about it and he cried and sobbed [in front of his informer] wordlessly for a very very long time, such as certain gedolei hador are capable of doing. when word of this got back to R Wolbe he reverted to the old system of starting with בראשית. again i don't guarantee that the story is true, but if it is, it is a moving example of a gadol hador who had the power [yes, he had plenty of power] to impose his view in a matter that meant so much to him yet held himself back from doing so.